Jerome: Maidenhead itself is too snobby to be pleasant. It is the haunt of the river swell and his overdressed female companion. It is the town of showy hotels, patronised chiefly by dudes and ballet girls. It is the witch's kitchen from which go forth those demons of the river-steam-launches. This delightful and charming movie is wonderfully faithful to the book by Jerome K. Jerome, and is just as funny. I discovered it back in 1978, looking for other roles that Tim Curry had played, and this has become one of my favorite movies of all time. 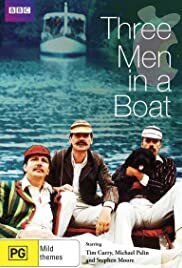 Gently humorous and full of beautiful scenery, the story of three young gentlemen going on a holiday down the Thames can't help but make one laugh. Finally, this excellent adaptation is available on DVD in the UK (Region 2 DVD), but can be played on region-free DVD players in the US, or one a computer's DVD player if it's set temporarily to Region 2, or made region-free. I've seen it available at several UK retailers online.